Holland - Belgium, and the right type . Its more than ten years ago that we had our first Laeken. We were lucky, we got a nice social dog who had much will to please and also was very beautiful to look at. Now and than we went to a show and very easy our dog won the Dutch championship. It was in the early nineties, at those shows, where we were witnesses of a disagreement between the Dutch- and the Belgian breeders of the Laeken Shepherd. It was in that time that Johan Weckhuyzen (v.d.Duvetorre) began to show Rotchild on shows in Holland. We were new and we were there when big discussions between the Dutch and the Belgian breeders took place. We had no part in this discussion, because for us there was only one Laeken Shepherd, and that was ours. We didnt had any notice about the standard. Weckhuyzen had a good view on the standard and he did breed a dog (Rotchild v.d. Duvetorre) according to the standard, which also was a very beautiful dog. 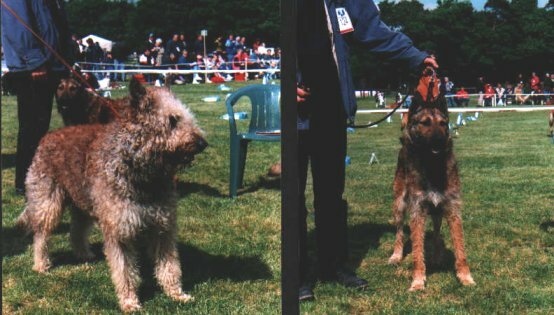 The others in Holland, from "the old type", only saw that this dog was different from the type they bred and that type wasnt according to the standard any more. But this they couldnt see. Thats a very well known disease in breeding and they call it " kennel blindness". Besides the Dutch knew that in Belgium, they used Malinois for cross out, in order to get a better type Laeken shepherd. So there was an unpleasant talk about "mongrels". Why after ten years pick up that old discussion, that wasnt very nice at all?? After ten years, we start to give breeding Laeken Shepherds a serious try. We were out of the Laeken world for a while and we noticed that this "different opinions" between Dutch and Belgian (type) breeders was still there. We also red parts of the old discussion on the mailing list of the Laekenzine. Okay there is a difference now, the influence and the productivity of the Dutch have become less and that from the Belgian has become much more. We hear the Laekenois in Belgium is rising!! Thats very, very nice!! From the "active" Dutch Breeders we dont hear anything at all. Since one year we are back in the "Laekenworld" again. In a few leading dogmagazins we red about the alarming situation of the Laeken Shepherd in Holland and we decided to do something about it. Because it is an old love of us, this Berger Belge Laekenois. In a short time we know more people and breeders than in the time before, and still we notice this disagreement and we think it is not good for the Laeken. Not long ago we red an open letter from a Laeken breeder in the Dutch club magazine (NVBH) . In this letter she is asking what appearance a right Laeken Shepherd must have. Not because she doesnt now herself, but because there are so many different types of Laeken, that, in here point of view, its very difficult for a novice to see it right. And when the Judge at the NVBH Clubmatch in Deurne may 1999, who did an excellent job at the laekenring by giving the public lots of information about the breed. Pity enough with a wrong view on the breed, she decorated all the heavy types. He could have said it nicer, but in the main lines he was right, Bernard Rie, in his comment on the NVBH clubmatch. No, we dont look in the standard right now. A breeder has it in his head and knows that all the Belgian Shepherds look a like without the coat and that there are no exeptions for Laeken Shepherds in this. In character the Laeken is more quiet than the other Belgians are, but there cant be too much of a difference between an attentive and busy Laeken and a quiet Groenendaeler. -The Belgian have innovated the Laeken Shepherd in time. -Some Dutch breeders dont see the improvement. But they are few and work separately. -Some people complain about the Dutch type. -Some people complain about the Belgian type. Somewhere in th middle I think. Laeken breeders are a bit different from the rest! Why don't they look at it the same way as the breeders of the longhaired Belgium Shepherds? A wildcolored pup out of two (black)Groenendaelers is a Tervueren, and a black pup out of two Tervueren is a Groenendael. And they are very interesting dogs for the breed. So when you see a Malinois, with rough hair all over his body and head, you're wrong. It's a Laeken. When you see a Laeken, with short hairs no moustache and garniture, you're wrong. It's a Malinois. When you see a rough haired dog without hairs on the head, it really can be a very nice dog, but as a Laeken he is not quite succeeded. And when you see a Laeken with short legs, heavy type, much hair on the head so you don't see headlines and he looks like a Briard, he is also less succeeded as a Laeken. Here we are talking about the type you can see. The phenotype! So, the breeders select the breeding animal. It can be an animal that doesn't follow the standard, when it gives a good offspring. Later breeders will be corrected by judges in this offspring. Now there is another small problem: the Laeken is a rare breed, and that, is not without danger. There is a bigger chance on inbreed problems, like dogs that are getting smaller and finer and less vital and less fertile. Now we come to a point where every Laeken becomes interesting for the breed. We must use many different dogs. In this rare breed things can go wrong when breeders use just this few big champion dogs for breeding. So use any type you like, use different dogs and different types, but select the right individuals for further breeding. The golden rule in breeding. Simple, but very, very difficult.